It’s the holiday home from hell, deep in an ancient English forest where no one can hear your screams. Something horrific is going on in the house – something that defies the imagination. Even hardened detective Jeff Temple, hunting down a brutal killer, is shocked to discover the chilling secret. When American Jack Keaton decides to take his family to the house on vacation, he gets a phone call from a mystery woman. She gives him a stark warning: You have to stay away from this place…your family will not be safe here. Cancel your plans and go on holiday somewhere else. But Keaton ignores the warning. He brings his wife and two children over from Texas for what he hopes will be the trip of a lifetime. As soon as the family arrives, their nightmare begins. "I had already read Rollover, also by James Raven and had thoroughly enjoyed it. 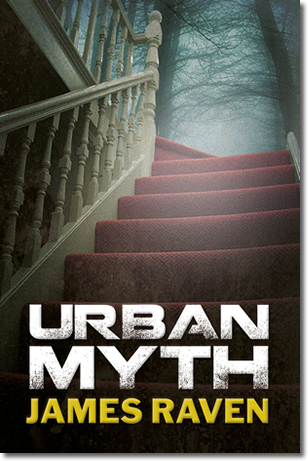 So I was very interested to see if Urban Myth lived up to my expectations. And it did! It is a real page-turner and managed to keep me awake long into the night. The writing is fast-paced, full of tension and plenty of unexpected twists and turns."